Stop in and check out the new Exmark Lazer Z 96" Diesel mower. Rated to mow an unprecedented 9.6 acres per hour this machine will out perform two conventional 72" zero turns. This is the ideal large acreage mower. With a 33-percent wider width of cut than a 72-inch mower the 96-inch UltraCut Flex Wing cutting deck significantly decreases the time it takes to finish large mowing jobs. In fact, a Lazer Z Diesel mower equipped with the 96-inch UltraCut Flex Wing cutting deck and the Yanmar 1.6-Liter Common Rail engine is capable of mowing more than 9.5 acres per hour. The robust engine and cutting width makes it the most productive diesel mower Exmark has built. The bat wing-style mower deck features a 48-inch center deck with two 24-inch wing decks, which are capable of articulating up to 20-degrees up and 15-degrees down to precisely follow ground contour. When combined with Exmark's rear-discharge deck design, the articulating wing decks allow the 96-inch UltraCut Flex Wing mower deck to deliver a professional finished appearance in less time than ever. 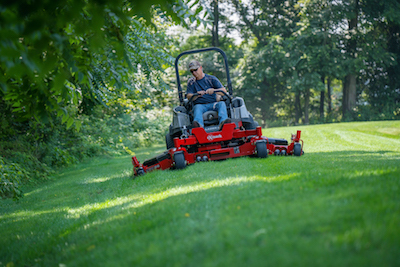 The Lazer Z Diesel Rear Discharge ride-on mower is ideal for applications such as cemeteries and municipalities that require effective control of discharged clippings and reduced sound output. Powered by the 37 HP Yanmar 1.6 Liter Common Rail diesel engine and available with a 96-inch UltraCut Rear Discharge cutting deck, the Lazer Z Diesel Rear Discharge delivers maximum performance when the going gets tough.